Breaking up is hard to do. So said Neil Sedaka in that 1962 Billboard classic. It was as true then as it is now, whether you’re in your teens or in your forties. So how do you actually move on after a broken heart? In another case, an old boyfriend contacted me out of the blue last year to give him some marital advice. Miraculously, it worked. He now credits me with playing a key role in keeping his marriage together. Somehow the act of helping him out in an impartial way enabled us – many years after the fact – to reunite as friends. I’ve often found that music works well if you want to “go there” without really “going there,” if you get my drift. At different points in my life, I’ve listened to Simple Minds’ Don’t You Forget About Me, The Grateful Dead’s Looks Like Rain and Silvio Rodriguez’ Mi Unicornio Azul when I wanted to cry into my beer. Either way, life goes on. How have you coped with a love that wasn’t meant to be? 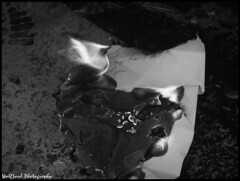 Image: Love Letter by Wolfsoul via Flickr under a Creative Commons license. great idea, shelley. my husband sometimes forgets that he did something with me (as opposed to his ex)-he’ll say “remember the time we…?” “Um, no I don’t.” It’s (fortunately) become a running joke between us! Lots of luck to anyone dealing with the all-too-familiar situation. I sure agonized, fantasied, infantilized, whatever, much too long about an abolutely over (& a good thing too!) relationship. Truth is, the 2 best ways to cope are (1) a newer & better relationship — (2) a tincture of time, as a medical friend puts it. Thought I just did — to repeat: too familiar a situation! I obsessed, fantasized, infantilized much too long a relationship that was absolutely over (good thing, too!). 2 best ways to cope: 1() a newer, better love, (2) a tincture of time, as a medical friend puts it.